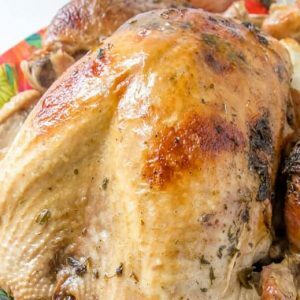 Juicy Roast Turkey is easier than you think with my buttery recipe, a bottle of bubbles and fresh herbs. Preheat oven to 350 degrees. Line a large roasting pan with aluminum foil (for easier clean up). In a small bowl, combine softened butter with dried parsley, rosemary, thyme, sage, Kosher salt and ground black pepper. Using your fingers, loosen skin from turkey meat. Massage butter mixture between skin and meat, and also a little in the cavity. Stuff the cavity with apple, celery and onion. Place the turkey, breast side up, in the roasting pan. Pour champagne over turkey. Cover loosely with aluminum foil, being careful to not have aluminum foil touch the skin. Bake turkey for 3 hours. Remove and take off aluminum foil. Baste with juices and champagne in the bottom of the pan. Return to the oven uncovered for 30 minutes, or until internal temperature reaches 180 degrees at the meatiest part of the thigh. Baste every 15 minutes. Turkey should be a golden brown. Remove from oven and carefully tent with aluminum foil. Allow to rest for 15-30 minutes. Remove cavity stuffing and carve. Garnish your serving platter with fresh herb sprigs. If you’ve tried this recipe, please come back to give it a rating and let us know how you liked it! *You can substitute Ginger Ale for sparkling wine.